I believe all of my culinary and life experiences create what I do on a plate. I feel a deep connection and respect for the culinary traditions around the world and how they have shaped their cultures over time. A cultures food to me is just as important as the language. It’s a very powerful non verbal way people communicate with each other. Every food event tells a very important story. That story is what continues to renew my child like wonder for food, its variations, and preparations. Using this feeling and the deep connection I feel too food, I ask myself these questions when trying to create a new item or special for the guests. Is the food or dish of the season? Is it timeless? Is it relevant? Does it engage you? Did I display multiple styles of cooking in my presentation? Did I clearly define the Star of the plate? Does the dish connect me to or remind me of any significant event or feeling in my life? Food should connect us to where we are, and where we have been! When people eat my food I want them to find themselves in that moment, closing their eyes and letting their senses take them back to memories of their life. Then watch as the food elevates them to their new surroundings. In order for me to use a particular product be it produce or protein I have to know the people connected and involved with it. There is a stewardship inherent with being a chef especially at this level of cooking. If people don’t know where there food comes from and what happens to it from the time the seed is planted they should and I am going to make sure of it. That responsibility is mine by the title I have been given. I take no liberties with the trust given to me by the guests and diners I’m given the opportunity to take care of. I source my proteins rigorously to insure not only safe food practices but also that it is the best I can offer. Most of my proteins except seafood come from the 4 corners region of the United States. Exceptions to the rule are ethnic items that need to be purchased from other countries to achieve authenticity or maintain the integrity of the dish and seafood of course. Produce is always sourced as locally as possible. The only time I venture out of our local area to find another independent producer is if one of our local growers can’t keep up with guest demand. I want people to know me and to know us. Food is intimate; it's everything to me. Some of my most cherished moments are those I have spent cooking and eating food prepared by the people I surround myself with. It's what I live for. A native of Kanab, Utah, Executive Chef Shon Foster takes a thoughtful approach to food, blending contemporary cuisine with local & international traditions. Chef Shon’s career path led him to the role of executive chef at Amangiri, which was named one of “America’s Best Hotels for Foodies” by Travel & Leisure in January 2013. Amangiri is a boutique resort tucked into the canyons of Southern Utah at Canyon Point, near the Arizona border, and a member of Aman Resorts, a collection of luxury resorts around the world. While at the helm of the kitchen at Amangiri in 2012, Chef Shon has featured dishes that highlight ingredients & culinary traditions native to Utah & the Southwest, while integrating flavors from around the world – a nod to Aman Resorts’ global profile. His passion is to let the pure flavors of the ingredients shine through while allowing room for experimentation and spontaneity. Chef Shon’s next venture led him back home to open Sego Restaurant in Kanab Utah. The result is an evolving menu that showcases his creativity in the kitchen and captures the vibrancy of the local culinary landscape. Chef Shon has charted his own path in the culinary world, spending a handful of years as a recording engineer in the music industry before discovering his passion of the culinary world and fine dining. 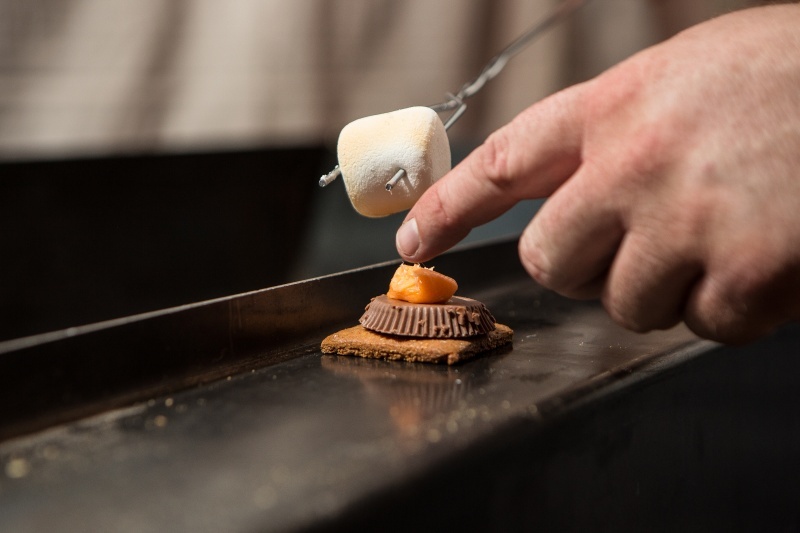 His efforts have culminated in an invitation to the 2013 & 2014 Pebble Beach Food & Wine Festival and most recently, his whimsical approach to food titled "S'mores School" was a popular display at the Nashville Southern Ground Music and Food Festival, catering for high end car companies around the united states. Chef Shon also has represented Utah and its culinary scene in Germany to promote Southern Utah tourism, and added public speaking at local farm conferences and economioc development seminars to his most recent experiences.